New Delhi: In the northern edges of Hyderabad, a few kilometres away from Hussain Sagar lake, a community of 20,000 houses is as good a geography as any to understand India’s tortured relationship with water. The residents of Rasoolpura, in the Begumpet area, get water once every three days. “This is a slight improvement," said Naseem Begum, 40, a housewife who lives in the Gun Bazaar area of Rasoolpura. She spends ₹ 160 a month to get about 30 minutes of water once in 3 days, roughly similar to the experience of an average resident of Shimla, currently in the middle of a crisis. How on earth could that be a “slight improvement"? Well, Rasoolpura used to get water once in nine days through peak summer. Until, in 2016, the neighbourhood mobilized and lobbied hard to get piped connections and better supply. Even this very moderate “improvement" has brought down the level of stress. We at least don’t struggle for drinking water constantly, Begum said. This is the daily reality for an estimated 600 million people in the country whom the NITI Aayog in a recent report said live in extreme water stress. “When a person gets by without even 20 litres of water per day to cook food or bathe, it doesn’t mean people have adapted," said Chandra Bhushan, deputy director general, the Centre for Science and Environment. “It just means the system is inefficient enough to not give them even basic dignity." While there are, of course, fights that break out along the endless lines that await water tankers, many living through the crisis also mobilize, petition and propose solutions. These often go unnoticed or never get scaled up beyond the immediacy of a colony or community. Such movements can have an impact: remember, extreme water hardships, in Chennai in 2001 and Bengaluru in 2008, set off a rainwater harvesting and lake preservation movement, respectively. “What is going to be the tipping point at which we reimagine our water institutions" asked Rohini Nilekani of Arghyam, a non-profit focused on water and sanitation. “It’s hard to say, but a crisis like the one we are in helps. Water is a vital issue, but there is no big imagination other than the interlinking of rivers," she said. There are some imaginations smaller in scale though, which do offer some ripples of hope. In April-May 2016, India watched in horror as poignant images of drought emerged from its richest state, Maharashtra. A train commissioned by the railways had to be arranged to supply water to Latur city. Yet, in the same year, there was a citizens’ response to drought when the Paani Foundation was formed with a mission to make Maharashtra ‘drought-free’. A personal brush with water scarcity drove the man leading the initiative on the ground, Avinash Pol. “I am from the Maan desh belt near Satara which has been a drought zone for decades. When I was 23, I thought I should not remain a passive sufferer," Pol recalls. “At the very outset, I figured out that unless people own a crisis and become part of the solution, no crisis can be solved," Pol says. The foundation selects drought-hit tehsils, trains a group of residents in watershed development and organizes a 45-day ‘water cup’ contest among villages to see who creates the maximum possible rainwater storage capacity, thereby gaming water conservation. In 2016, the foundation began modestly by selecting only 3 tehsils for the mission, but has scaled up this year to as many as 4,032 villages spread over 75 drought-hit tehsils in four regions of Maharashtra—Marathwada, Vidarbha, North Maharashtra, and Western Maharashtra. “In 2016 and 2017, the participating villages created an aggregate storage capacity of 10,000 crore litres of water. We will know how much more capacity they have added this year in August," Pol says. When Verghese Kurien, celebrated for his contribution to the ‘Amul’ milk cooperative movement, was offered a chance to replicate the model to create a network of farmer collectives for the sharing of water flowing through Gujarat’s irrigation canals, he said it could not be done due to the “challenge of defaulters". Recalling the incident, B.N. Navalawala, who is currently an advisor to Gujarat chief minister Vijay Rupani, said that according to Kurien, there was a fundamental difference between milk cooperatives and irrigation cooperatives. Since water collectives function on the principle that everyone pays a small fee for maintaining the canals and the use of water is managed collectively, the thinking was that water supply could not be cut off for the entire channel just because of one renegade farmer who might refuse to pay the fee. “In the case of milk cooperatives, one can debar or boycott a defaulter but the same can’t be done for irrigation cooperatives," Navalawala said. However, staring at a severe water deficit this year due to reduced flow of Narmada water, the state has come full circle on the idea of giving farmers power to manage their own water and is planning to revive water user associations. The experience from other states, particularly Andhra Pradesh, has shown that granting power to local cooperatives work far better than government mandates. “When farmers get ownership of irrigation, they will not try to misuse water or damage the resource," said Apoorva Oza, chief executive officer, Aga Khan Rural Support Programme, which is helping the Gujarat government establish these user associations. The state now has ambitious plans to get over 4,400 ‘irrigation cooperatives’ up and running by 2020. In May 2018, a slew of lake preservation groups in Bengaluru came together to create a joint federation, which is perhaps the largest coming together of urban residents anywhere in the country to tackle a water-related concern. If all the lakes in Bengaluru are rejuvenated, the city can use them to meet almost 70% of the city’s water requirement, said T.V. Ramachandra, a professor with the energy and wetlands research group at Indian Institute of Science (IISc). Amidst the recurring water shortages and conflicts over Cauvery, the lakes have emerged as a symbol of one possible way forward. Friends of Lakes (FoL), for example, has grown from trying to conserve one lake in Bengaluru to now offering conservation services for around 22 water bodies in the city. But joining them is not easy. “We have a 3-6 month probationary period. If those who approach us do not involve the local villagers, farmers and fishermen, then we do not associate with them," Ramprasad V., co-founder and convener of FoL said. Nitya Ramakrishnan of Whitefield Rising, another citizen’s initiative in the residential hub of IT professionals, says the community is trying out a new strategy by getting the local elected legislator to appoint officials who can bring marked improvements. Chennai is one of the few urbanized zones in the country where the groundwater table has consistently gone up on a number of occasions over the past decade, including last year. The reason: the city managed to implement the simplest possible solution of installing rainwater harvesting structures in a large proportion of homes and buildings. “Others should be copying what happened here," said Sekhar Raghavan, who set up the country’s first ‘Rain Centre’. It was a classic collective action problem, until the government threatened to cut water and electricity connections for those who didn’t fall in line. “Water harvesting is a community effort. There will be an impact only if enough people do it," Raghavan said. While everything is far from perfect, since at least some of the newly installed rainwater harvesting structures have turned out to be poorly designed, the city can still claim the distinction of hosting an estimated half a million buildings with rain-catching devices. The difficulty of mobilizing enough people to get on board such an initiative is obvious from the experience of other parts of the urban landscape. 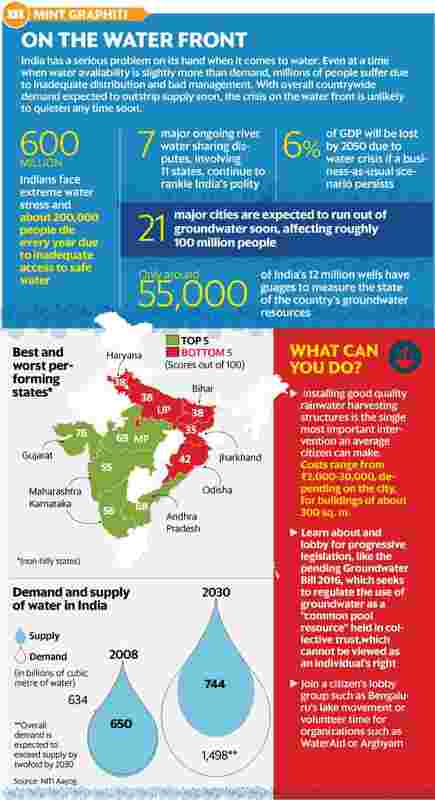 Though a national mandate is in place that requires the installation of rainwater harvesting structures in every building, less than half of the government buildings in New Delhi have them in place, according to a ministry of housing and urban affairs database. Important government buildings like the Election Commission, the Supreme Court or even the NITI Aayog don’t comply. Delhi’s failure to catch enough rainwater fuels a recurrent summer tiff with neighbouring states to pump in water from afar. In contrast, London supplies about 4 billion litres of water each day to residents merely from large rainwater catchment ponds in upstream Thames River. “Rain is the predominant source of freshwater on earth. We should catch rain, it’s free," Raghavan said. While some form of natural recharge was possible in cities earlier, Raghavan said that now we have concretized so much of the surface that artificial recharge is the only way forward. “There should be recharge plans at both the micro level in houses and the macro level led by the government in parks, roads and public buildings," he added. Abhiram Ghadyalpatil in Mumbai, Maulik Pathak in Ahmedababad , Sharan Poovanna in Bengaluru and Yunus Y. Lasania in Hyderabad contributed to this story.